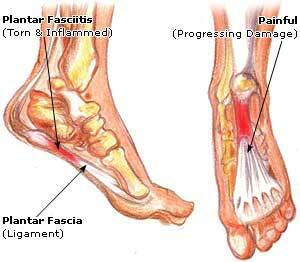 Inflammation of plantar fascia is known as plantar fasciitis. It means severe paining of foot. Plantar fascia is a long, broad, fibrous band of tissue stretching from the heel bone to the fore foot. Plantar fasciitis is common among pregnant women, obese and diabetic people. Plantar fasciitis is one of the most common causes of heel pain. The condition is also often described as heel spur syndrome. Heel pain could however have a variety of causes and could also be the result of a stress fracture, arthritis, tendonitis, nerve irritation or in some rare cases because of a cyst. Because of the various possible causes of the pain it is important that you have the problem diagnosed by a qualified medical expert rather than base your treatment on assumptions or self diagnosis. There is a band of tissue similar to a tendon that originates in the heel and runs all the way down along the bottom of the foot. This tendon like tissue band is referred to as the plantar fascia. The plantar fascia works like an elastic band with a sort of spring action between the heel and ball of your foot forming an arch. The arch on your foot is in fact formed because of the plantar fascia and for those with a high arch the band is probably short, while those with a band that is longer would have a low arch. The plantar fascia is protected against impact and from the stress of walking by a pad of fat in the heel that shields it, but when damage does occur you would be sure to experience severe pain. Plantar fasciitis pain may be felt in the ankle, arch of the foot, in the ball of the foot, and towards the top of the foot. You would generally experience a sharp stabbing pain, in plantar fasciitis, usually with your first steps itself on getting out of bed. As the muscles in the foot limber up however the pain does tend to decrease in most cases, but it may return if subjected to stress from standing for prolonged periods or if you stand up suddenly after having been seated. Because of the high levels of stress on the feet and the plantar fascia from running it is not uncommon for athletes and runners in particular to suffer plantar fasciitis. Obesity or being moderately overweight could likewise put you at increased risk of developing plantar fasciitis because of the increased strain and pressure on the feet and the plantar fascia. This also holds true for pregnant women, in which cases the problem should cease to be a bother post delivery. Wearing shoes with adequate support can help minimize the risk of developing plantar fasciitis. Although any age group can have plantar fascia, it is more commonly found in middle–aged people. Symptoms may appear suddenly or slowly over time. A person having plantar fasciitis will experience sharp pain over his heel. This pain is more severe when you wake up in the morning and try to stand. This pain increases if you stand or exercise for prolonged period. Sometimes it may lead to rapid weight gain. As you already know plantar fasciitis is caused by damage to the plantar fascia, which is the connective band of tissue from the heel bone to the toes or the ball of your foot. The fascia is susceptible to inflammation sometimes, which may occur as a result of overuse or overstretching it. When this happens it can cause a significant amount of pain and making walking quite a task. The causes of plantar fasciitis are therefore largely stress related and there are several risk factors that could put such stress on the fascia increasing your chances of suffering the condition. People with foot arch problems, which would mean those with unusually high or low foot arches are a lot more likely to suffer from plantar fasciitis. If you are overweight the stress of those extra pounds does bear down on your feet and it does increase the risk significantly. Repetitive and dramatic stress or shock such as from running can cause plantar fasciitis to develop, particularly if you’re running on uneven surfaces or downhill. If the Achilles tendon, which connects the calf muscles to the heel, is excessively tight then you run a risk of suffering plantar fasciitis. Your footwear is also a lot more important than most people assume and it would be wise to invest in good footwear that provides adequate support. Age is also another factor that may put you at some risk, as it does tend to affect men in their late middle ages or elderly men. Although heel spurs may be present in some individuals who suffer from plantar fasciitis, this is a separate condition and it is not necessary for heel spurs to occur as well. Plantar fasciitis is caused by repeated overloading and overstretching of plantar fascia. Because of this the tissue tears at the junction of the heel bone and plantar fascia. Poorly cushioned shoes may also cause plantar fasciitis. Aging also contributes to plantar fasciitis because it causes wear and tear of the plantar fascia tissue. Pronation, high heel, high arches, and flat feet may cause plantar fasciitis. Any traumatic injury because of an accident may also cause plantar fasciitis. One of the direct causes of plantar fasciitis could be structural imbalance of the foot. Poorly cushioned shoes may also cause plantar fasciitis. Aging also contributes to plantar fasciitis because it causes wear and tear of the plantar fascia tissue. Pronation, high heel, high arches, and flat feet may cause plantar fasciitis. Any traumatic injury because of an accident may also cause plantar fasciitis. One of the direct causes of plantar fasciitis could be structural imbalance of the foot. The symptoms of plantar fasciitis may not be hard to recognize but most of these symptoms are common to many other problems that affect the foot too, and not all symptoms may be present in every case. The stabbing heel pain from plantar fasciitis may be the defining symptom, but this pain sets in gradually. Another feature of plantar fasciitis symptoms would be that the condition usually affects just one foot, but it can occur in both simultaneously. The pain radiates from the bottom of the heel and is generally most intense when you just get out of bed in the morning. The pain may increase in its intensity over some months, if it is neglected off course. Although the pain that is experienced is usually worse if you’ve been seated for extended periods and then get up it usually subsides with some walking as this stretches the plantar fascia. Always avoid high heeled shoes if you suffer from plantar fasciitis. Give ice massage to the bottom of the aching foot. Stretch your calf muscles before getting out of the bed. Use OTC arch support. Take good rest. Treating plantar fasciitis naturally with acupuncture and massages is not only popular but can be quite effective. There are many self care measures for plantar fasciitis heel pain and spurs with stretches, taping and supports that can help provide some plantar fasciitis relief. Plantar fasciitis treatment exercises for the heel are commonly used as physiotherapy for healing the condition. The use of orthotics for plantar fasciitis, night splints for plantar fasciitis, and plantar fasciitis stretches is quite common. • Always make it a point to wear well padded shoes and don’t walk barefoot as this puts increased stress on the fascia. • Apply a cool compress against the affected heel for fifteen to twenty minutes at a time throughout the day whenever possible to reduce inflammation. • Give your heels a chance to rest. Try and avoid putting any pressure on the heels for a few days, particularly when the pain is severe. • Stretching exercises that work on the calf muscles can help to relieve the pain and hasten recovery. • You can also use night splints to stretch out the fascia allowing it to heal. • If you cannot give up running even temporarily then make it a point to at least reduce your running distance temporarily, until the condition has resolved. • You don’t need to keep running to stay physically fit, and if this is your concern then you can switch to swimming or cycling instead for the time being at least. Eat a healthy diet because nutritional deficiency may slow down the recovery rate. If you have got plantar fasciitis then take a break from your heavy activities like running and exercising.